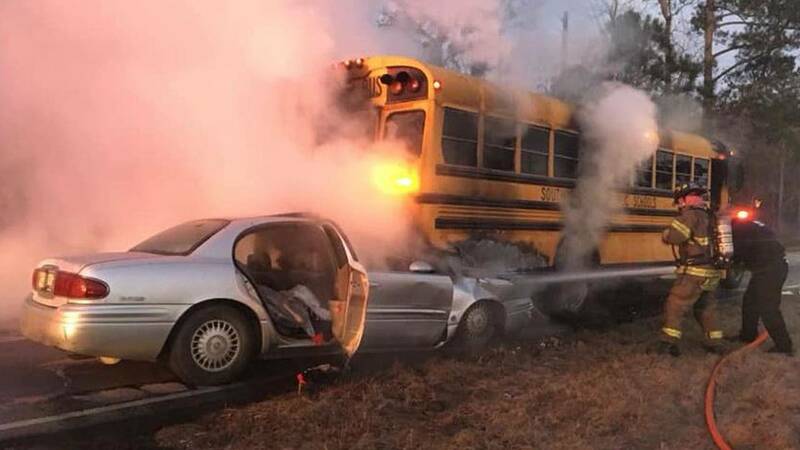 A South Carolina school driver with only 45 days on the job is being praised for coolly leading 40 terrified children from a burning bus. Bernardine Reed was stopped at a railroad crossing at 6:30 a.m., with the bus door open, as is protocol for such stops, according to chief Thomas Spivey of the Palmetto Rural Fire Department. "A car just decided to drive up under the bus," Spivey told InsideEdition.com. The vehicle ended up about five feet under the school transport, where it burst into flames, he said. A little girl in the back of the bus yelled out that she could see smoke that's when Reed got all 40 of the kids on their feet, in a single line, and herded them off as both vehicles burned. "She's a mom, so that mom instinct kicked in, and she got 'em off and stood off to the side until help arrived," Spivey said. At a brief press conference, Darlington County School District Superintendent Tim Newman said the new driver "has become my hero." "Ms. Reed took charge and took care of them," the superintendent said. Reed seemed embarrassed by the whole thing and smiled a lot. "I'm just a mother that got 40 kids off a bus to safety," she said. None of the children were hurt. The driver of the car was transported to a local hospital for treatment of non-life-threatening injuries. The South Carolina Highway Patrol charged the 29-year-old driver with driving too fast for road conditions, Spivey said. Reed, a former special education instructor, said the children were "screaming and crying," but once off the bus and huddled together while waiting for authorities, everyone calmed down. "They were fine," she said. School children in the district participate in drills about how to evacuate a bus in an emergency, she said. "They all know that when something happens, you have to follow my rules. And that's just what they did." She wasn't frightened, she said, she was just focused on getting "her babies" off the bus. "This is what I do. This is what I love, so I can't be scared," Reed said.